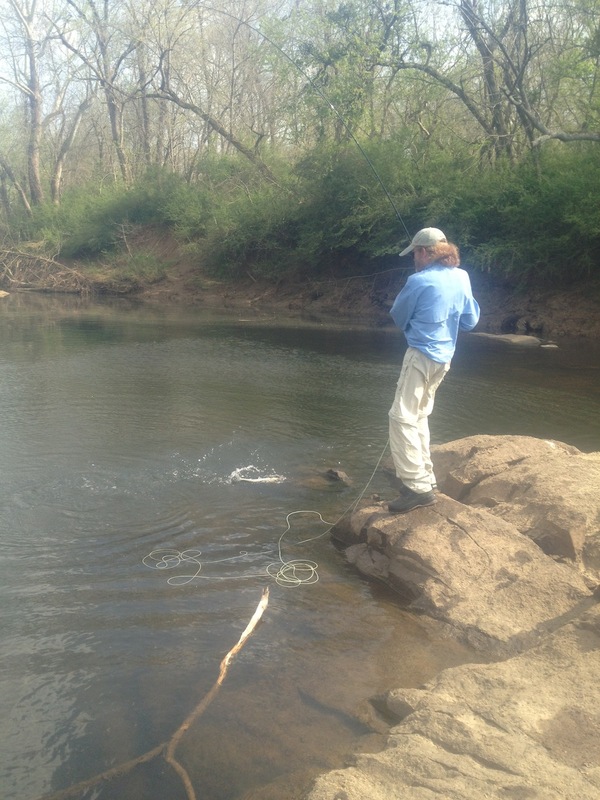 It’s an annual tradition…I try to make the 2 hour drive to Weldon and fish the shad run on the Roanoke River. Mid to late March is the time. This year, it’s been so warm, I was concerned that I might be a week late. However, it all worked out in the end! I picked up Sam at his house just after 8AM on Friday 3/23, and we pointed my truck toward Weldon, with our two pontoon boats in the back. Arrived at the river just after 10, including a stop for gas and provisions. We rigged up our boats and rowed across the river to try to find a spot in the eddy below the big rapid. The river was low and clear, running about 3500cfs. Several boats had the good spots, so we beached on the rocks and started casting. 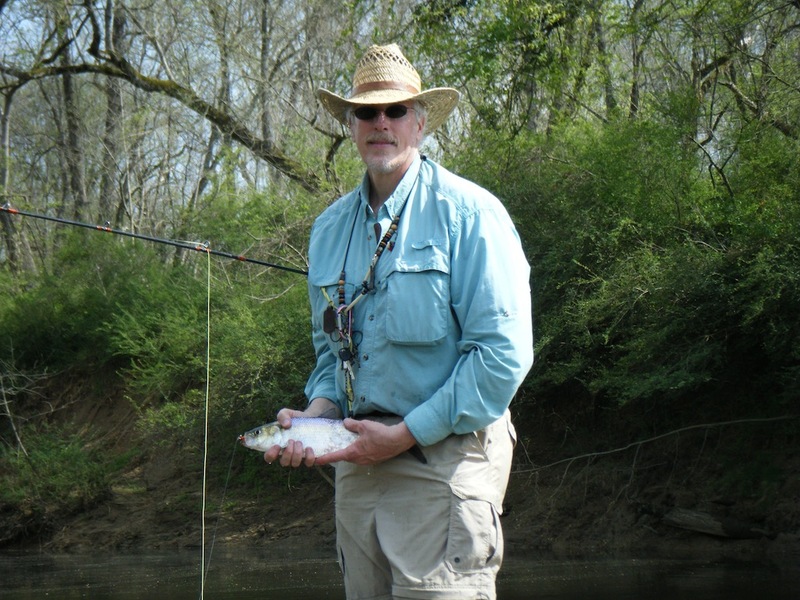 It was very slow, and by lunch, we’d caught one shad and one little white perch. Action for our fellow fishermen was fairly slow as well, though one boat, anchored in the seam near the main flow was doing well. It’s a combination of current and angle of presentation of the fly, depth, and color. They had the mojo and were steadily, though not continually, landing fish. We tried several places on the rocks, but couldn’t find the solution. I went over the rocks to check out the top of Little River, and tried for about 10 minutes with nary a bite. I did have my favorite hot pink fly tied on, and that would prove to be a key. After lunch (it’s better to be fishing that at work, even if not catching fish), Sam went back to the rock island at the in Little River, and I walked along the bank on the island (on the far side from the boat ramp). When I saw him about 1PM, he said he’d caught a couple and missed several using an orange fly and a very fast retrieve. Let it sink (we were using intermediate sink tips) for a few seconds, and retrieve as fast as you can, he said. He said the mojo was coming back. While he tried from the rocks on the main branch of the river, I went back to Little River and tried Sam’s suggestions. 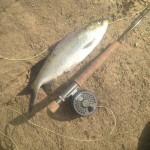 Caught a shad on the first cast. Orange. Sink. Fast. Cool! 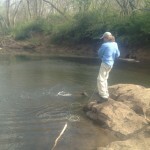 By the time Sam got back, I’d landed 5 shad and missed several more. We both stood on the rock and started pulling ’em in. In the next two and a half hours, we caught shad until our arms were tired. Each of us easily landed 40 fish or so, and several times, we both had fish on at the same time. Nice fish, big and strong, putting a great bend in the rods. About 3:45, we decided that we better row back across the main river while we still could move our arms 🙂 . Loaded up and made the drive back home in outstanding spirits. 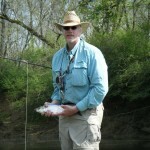 This entry was posted in Flyfishing on March 23, 2012 by joel.